As is often the way with blogs (and probably the hobby in general), I have been letting things slide here, and I realise it's about five months since I posted an update. The reasons for this are many. At first it was the business and the Christmas period getting in the way. After that, we decided to move house and there were all the stresses and strains you associate with that. Needless to say, here we are in May and I haven't painted a single mini yet in 2017. We moved nearly two months ago at the end of Feb, and it's been much slower going get set back up than I thought. Despite all that, the house move will in the long term be very beneficial. A new man cave has been alloted to me by the ever patient wife, which I am currently kitting out (more on that shortly) and we now have a large double garage which will, eventually, become my wargames room. That is sadly a very long way off, got to get the painting room and business all back up and running first. Then it will take some time to save to get it converted. Bearing in mind that is a baneblade at the front, you can see it gives me plenty of space. I intend to add paint racks, storage space and generally have a neat and tidy area to work in eventually. But that will take time. As you can see, things are progressing at reasonable pace (I have way too much to paint though). I am hopeful of getting some hobby done in the very near future. Money will of course dictate how fast it all happens, but time is always a factor. Shift work and two small children don't help! But that's it for now. I'm glad I am updating the blog again, I wonder what I'll end up painting first. As I think I mentioned in a few previous posts, I have opened my own Wargaming business as an independent trader! This is all very exciting for me - I've always wanted to work or myself and decided to combine this with the hobby as a second job in addition to the day job that pays the bills. At the moment, I only carry Warlord Games prodcuts but at what I believe to be a great discount of up to 24%! It's early days but it seems to be going really well. I offer a friendly bespoke service so you can get your Warlord Games goodies for the best price possible. So go and checkout cardboardfortressgaming.com and let me know what you think! I am adding products as fast as I can so keep checking back for more items. On the hobby side I do have lots more stuff to show off - it's just finding the time to photograph it all! Hopefully a couple more blog posts coming soon. Not a fantastically long post, but part of my catching up with what I have panted recently. In my quest to work my way through the Battlegroup Polish list, here's two more options for the infantry platoon I am currently building. I couldn't find much on what uniform the medics wore so I coped out and added a simple armband to mark him out. A nice simple model and quite a pleasure to paint. Although out of date by mid war, AT rifles could make a mess of the early panzers. All the miniatures are Early War Miniatures. In order tocomplete the infantry platoon I am still waiting for Capitan games to put there Polish back into production so I don't have too many similiar poses. It appears that I have been very neglectful of the blog, but all is not as it would seem. I have in fact been busier than ever in the hobby. I've been painting and gaming at quite a decent pace and I have managed to make quite a dint in my Polish force. But more of that later. The big development is that I have set myself up as an independent wargaming trader. I am initially selling Warlord Games products, with a focus on Bolt Action 2. This is a part time buisness for me but one I am excited about. First of all, all my profits will be put back into more products so if things go well the range I stock will only grow. Second, it gives me the chance to potentially grow my hobby in nurmerous different ways. At the moment, I have a small selection of things on eBay and people are welcome to order through me for Warlord items as I submit fairly regular orders. The best way is to head over to facebook and like my page as I am managing it through there in the first instance. Research has started into an online store so I'll keep you updated with progress. I currently offer a 22.5% discount on most of Warlords range. But back to the hobby. I have completed a Bofors AT gun along with limber for my 20mm Polish. Here they are. I've got a few other bits finished that I will upload in due course and try to bring this blog back up to date. It seems that Games Workshop have been changing lately, what with a return of the specialist game department and their return to facebook. 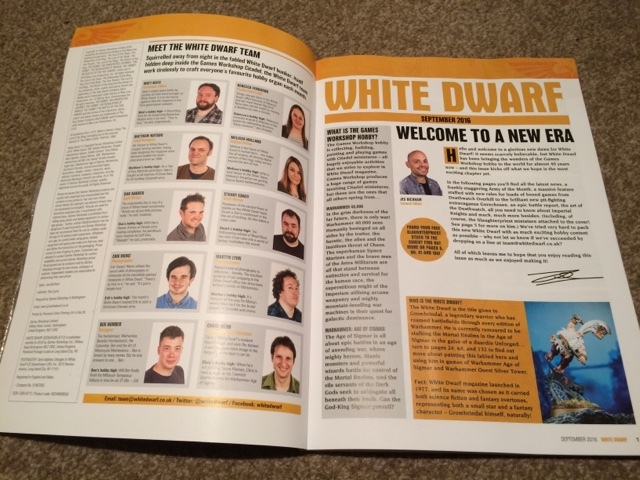 Another seeingly retrograde step is to move back to a monthly White Dwarf magazine. 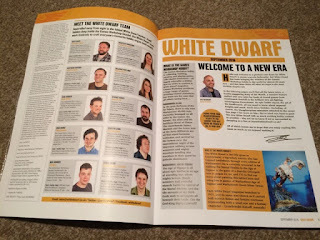 Quick reminder: A few years ago they moved to a weekly format for White Dwarf. Up to this point, it had been monthly and I had loyally bought every issue since 130, way back in October 1990. I used to love it, but towards the end it had deteriorated badly. I never got into the weekly format, mainly because it was the time I was losing interest in GW and also it was hard to get hold of unless you were quick! First impressions were good. It came in at £5.99 against say Wargames Illustrated at £4.95, so it's normal magazine price. It seems heavy and good quality, clocking in at 148 pages. It comes with a free mini - useless to me as I never liked Chaos even in my GW days, but free toys are never a bad thing. So far, so good. Into the magazine the first two pages are the editorial and staff photos, followed by two whole pages just for the contents list. After this there are 16 whole pages of whats new. It's all very glossy, goes to great lengths to point put how awesome everything is, and covers the whole GW universe - miniatures, books, terrain and computer games. What I then have a small problem with is after 16 pages of this, we then go into two pages of adverts. 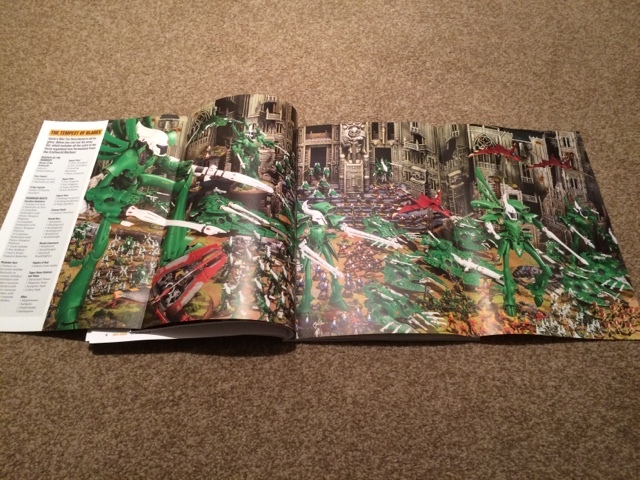 It reminds you we still have in our hands a GW catalogue and promotional magazine. After that there are two pages of readers letters. Sounds great, but a lot of these letters seem along the lines of "wow, you guys are doing a great job," without any real fan engagement. It left me a little cold. The next two pages are "Eavy metal" spotlight, and are photos of new minis. It is only at this point that we reach the first real article - The Tale of Four Gamers. A style of article used in the old White Dwarf, four gamers collect armies over several months, and document it. I like that idea, but each collector only writes two paragraphs, so it likes a real in depth analysis. This is a readers army section. It features great photos of the army and plenty of text from the owner describing how he collected it. Also, a four page pullout of the army all nicely laid out. We then have a large chunk of extra, and to my understanding, new, rules for several of GW's games. Thumbs up for this - it's far more like supporting the hobby. For me personally I can't use this but if you play these games, you're in! I won't bore you with the rest in any great details. We have a very flashy battle report, some backgroud for Imperial Knights, a feature on terrain at Warhammer World and Blanchitsu. There is an article on various staff members Kill Teams for 40k, and a converting article (all GW pieces only of course), along with a painting guide. It finishes with some really nice photos of readers models, along with a side box contianing tips on photographing mini's. Let's boil this down. I am not unbiased - I fell out of love with GW a few years ago. I like the direction the magazine is going, and I imagine if you do all or most of your wargaming in the GW unuivese, there is plenty of stuff for you here, the extra rules being a good example. But I can't help feeling it's a tired and souless effort in some ways. Monthly battle reports SOUND good but I feel its too much of a good thing. Back in the day they were once or twice a year and eagerly anticipated, and came with tactical maps etc. Now, they are every single issue, so the magic is gone. I also think Tale of Four gamers need more substance but has been done before and one bug bear for more is Blanchitsu. I know John Blanche is a hobby god and has some serious skills, but do we really need a regular monthly article showing yet more of his drab and dirty style miniautres, nice as they are? Not really. I found myself wanting more words. A quick flick thorough and I can't find a single page of just writing, or even mostly writing. The most you get is two thirds of writing and the vast, vast majority of pages are half or less. It's very clear that this is desgined to further GW's mini sales, and the abundance of flashy photos support this. 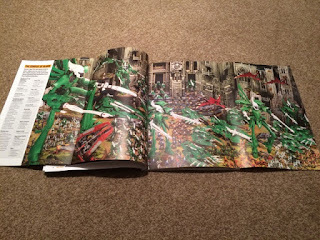 I would also have really have liked to see some sneak peeks, and maybe at least a very small mention of Lord of the Rings and the other games, but the magazine exsists in a GW only, 40k/Age of Sigmar bubble, which I think is a shame. GW is a massive part of the wargaming hobby (like it or not), if only as a gateway, and it's a shame GW doesn't capitalise on this. Final verdict: Good, but could do better. 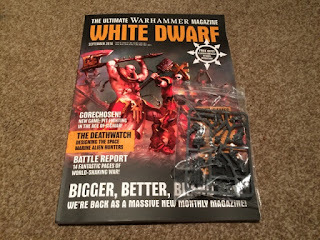 I will only buy this again if there is an issue with something for me in it, such as the upcoming return of Blood Bowl, but I will not be resubscribing as it stands. But, if you live and breath the GW universe, it's worth cover price. Managed to get another 10 standard rifle infantry done for the ongoing Polish army project. All rifle armed and destined to bulk out the platoon's rifle squads, they are all from Early War Miniatures. Once more I can't seem to get the photos right, one has come out very dark despite some editing and the models being under two massive daylight lamps! Oh well, you get the idea. As I previously mentioned an order has fallen though for a large chunk of Polish stuff, which was needed to complete the infantry platoon and HQ. I can get the minituares from elsewhere but I am awaiting a webstore to reopen to put the order in. What that means is that I have an Bofors AT tank gun with horse limber and an AT rilfe to go and I'm done with what I have. Good job the general back log is big enough to keep my busy!